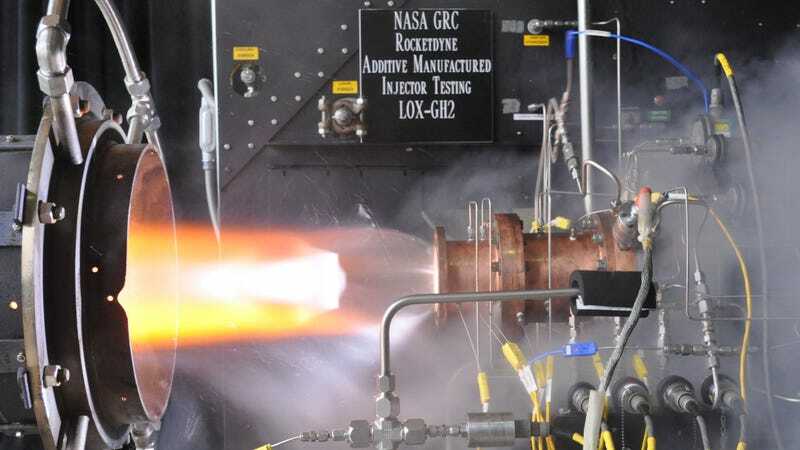 NASA and Aerojet Rocketdyne tested their first 3D-printed rocket engine injector today. What you see above is the little guy passing the test with flying—and flaming—colors. Success is a beautiful thing. The process used to create the injector, which NASA likes to call "additive manufacturing," is actually a step or two more insanely awesome than your average molten-plastic variety of 3D printing. NASA's method involves using lasers blasts to melt stacks of metal powder into gadgets that can sustain rocket blasts. And if tests continue to go this well, NASA could soon be using laser blasts to melt metal powder into entire spacecraft. Not only does this tech make for better rockets by reducing the amount of pieces involved, lessening points of possible (explosive) failure, but it could also enable the easy printing of rockets in orbit someday. And these printed components can be made in half the time it takes to make traditional ones, at just 30 percent of the cost. It's awesome tech all the way around.